This weekend (20-22 September) I took part in the Intermission project by the Osso collective. Selected works will be broadcast and streamed by stress.fm. What can a field recording tell us about architecture? When we think about architecture we think of how a building looks, it is dominated by the tyranny of the visual. How a place looks is only a small part of being there. The sound of a place, although perceived secondarily, is fundamental to our experience of it. ‘Intermission’ was an international ‘open call’ inviting artists to collaborate in the construction of an audio map by making a ‘portrait’ of their locality – mapping the air space between A & B. This piece comprises seven different recordings taken in different locations in the district of Wedding in Berlin on the same day. The length of each section is determined by the interval between the flights above. This is on average 5 minutes. All but 2 recordings are taken in more secluded recreational areas. Of those 2 recordings one is at a busy intersection and the other is from a neighbourhood side street, but is still quite noisy. On this particular day all aircraft were landing, none were taking off. For the “quieter” sections, as the planes came into land the direction of the sound was often masked and reflected by buildings of 5 stories in height or more, often giving the impression the aircraft was coming from a completely different direction, only at the last minute revealing its true position. By the parks and rivers the approaching sound shatters the peaceful even texture of wildlife, nature, and human utterances. 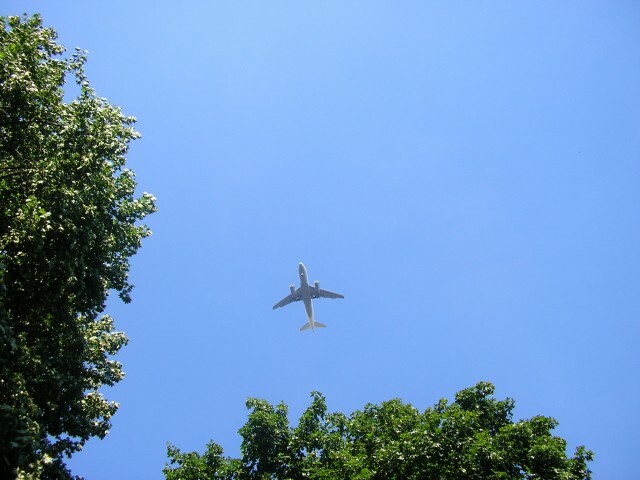 In the street locations the noise of the aircraft has to fight to be heard, with more local sounds having greater impact. In this particular locale the aircraft sound could be said to be a “keynote” sound, omnipresent everyday since the 1960’s. As the airport they are landing at, Tegel, is due to close sometime in the next year, this sound will be forever silenced. The quiet places will take on a more uniform tranquillity, but the noisy areas will presumably just get louder and louder. The recorder was set at the same record level for all tracks and no post-production other than crossfading was performed. Therefore level and dynamic differences represent real-world conditions. Reblogged this on Wedding is not Neukölln.